The rear pressure self-leveling system on the DH Series 3-Point Offset Disks allows the operator to adjust the spring-loaded leveling system to obtain equal penetration by the front and rear gangs. It also stabilizes the direction and side shift of the disk. 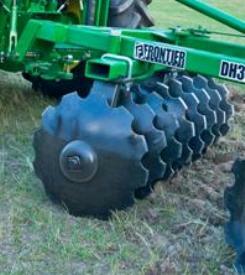 This is ideal for stubble cutting and compact soil conditions. The disk gangs employ 38.1-mm (1.5-in.) cold drawn steel axles with sealed bearings. 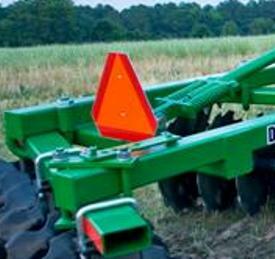 Disk gangs on the DH34 Series 3-Point Offset Disks are easily adjustable to match changing soil conditions. Use a more aggressive angle to penetrate rough and uneven soil or a reduced angle for a smoother finish. 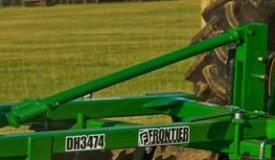 The DH34 Series 3-Point Offset Disk comes with 61-cm (24-in.) notched blades made of hardened steel for great weight per blade penetration. Front and rear blades are set at 22.9-cm (9-in.) spacing.